Recently, my sweet neighbor had triple bypass heart surgery. Many years ago, just days before my oldest son was born five weeks early, my dad required triple bypass surgery. I popped in to visit my neighbor when he came home from the hospital and asked if there was anything I could do...or bake. His wife immediately spoke up, "No more bread....sorry, Frieda. Doctor's orders." He looked at me with sad puppy dog eyes. I knew that look. I had seen it before in my dad's eyes. After making a few suggestions, he again gave me the puppy dog eyes and said, "Cookies?" This recipe begins with walnuts. 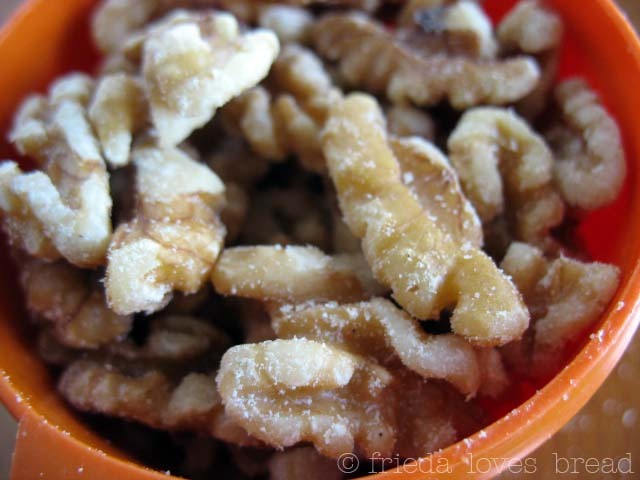 Did you know that walnuts rank as the healthiest nut to eat? This looks like a chunky peanut butter! In a traditional cookie recipe, the sugars and shortening/butters are mixed and the egg is thrown in. There are no eggs in this recipe. A cookie with no eggs? 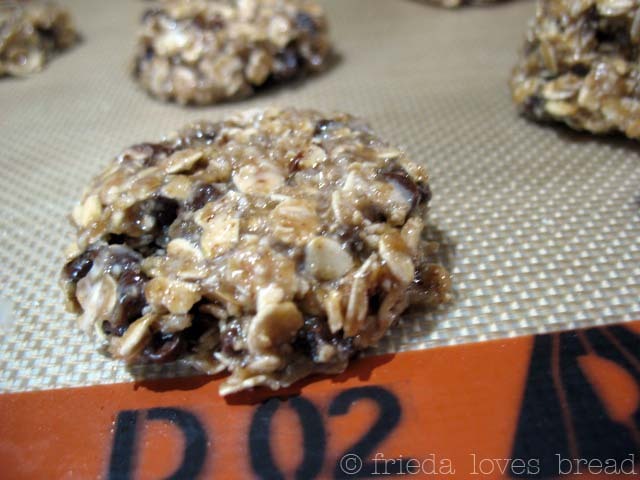 Okay, I do have a no-bake cookie that has no eggs, but this cookie recipe is baked! 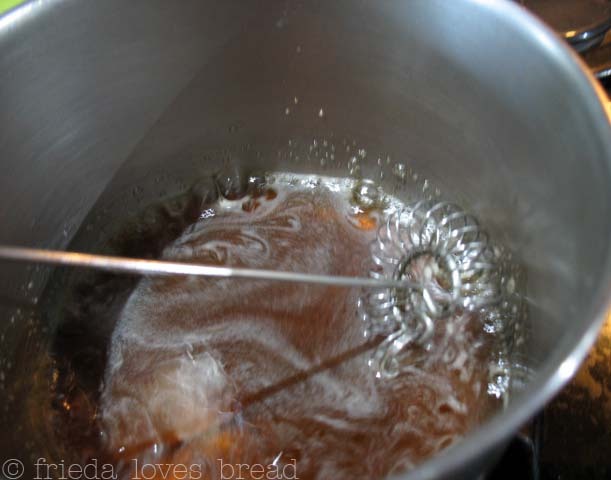 The recipe says to whisk the brown sugar and 1/2 cup of water in a small saucepan and bring the mixture to a boil. 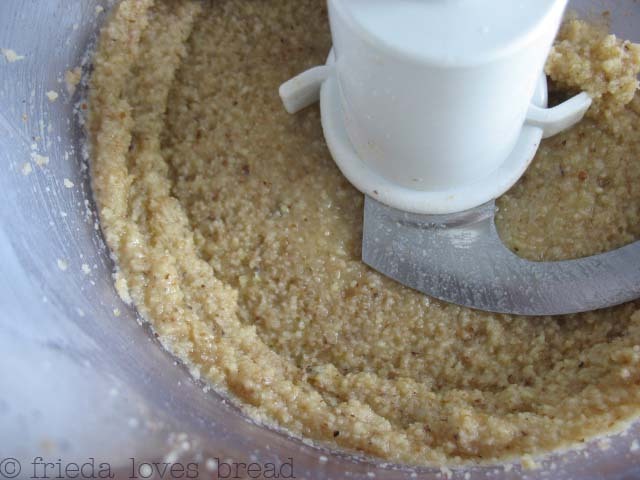 You can use Splenda brown sugar for baking in this recipe. Who am I to argue with a new recipe? 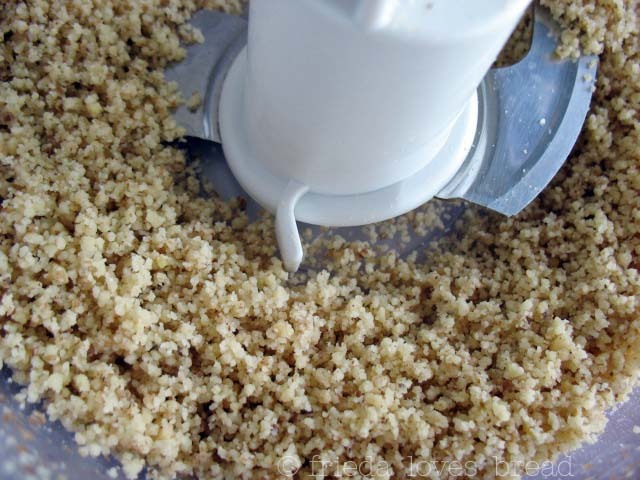 The boiled brown sugar is mixed in with the walnut "butter" and vanilla extract. 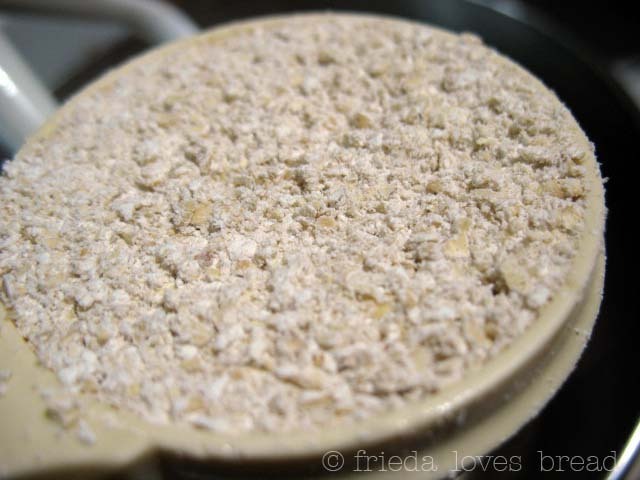 I don't have oat flour, but I do have rolled oats that I pulsed in a blender. It should work, right? Oatmeal. A grain that is healthy for your heart. Have a gluten intolerance? You may be able to find gluten free oats here. This is mixed in with baking soda, salt, cinnamon and tossed with the brown sugar mixture. 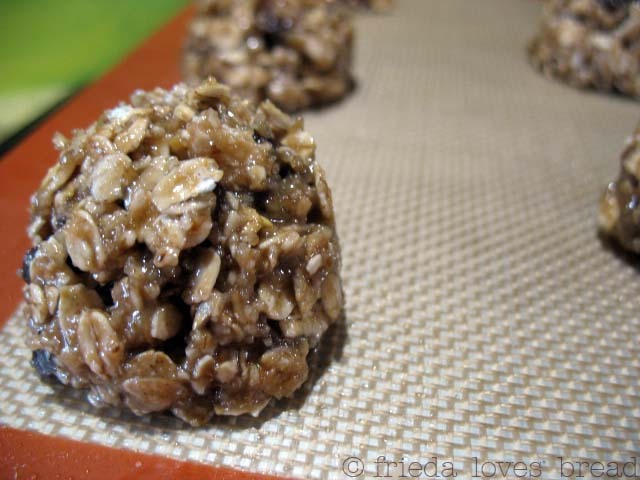 Okay, the recipe says to let this cool for 10 minutes, fold in the rolled oats and mini chocolate chips. If you don't let it cool, you'll melt those itty bitty baby mini chocolate chips! They are dropped with a 2 T. cookie scoop onto a cookie sheet lightly sprayed, lined with parchment or Silpat. I almost threw these in the oven, but I had to check the recipe one more time. Whoops....there's one more step before baking! Flatten the tops with a glass dipped in water. Okay, now I'm really nervous. Are these going to spread out and make a huge mess? There are NO EGGS holding this cookie together!! The suspense was killin' me. Fortunately, these only take 8 to 10 minutes to bake... and 3 minutes to cool on the baking sheet. They did spread...but not to a crispy thin cookie. 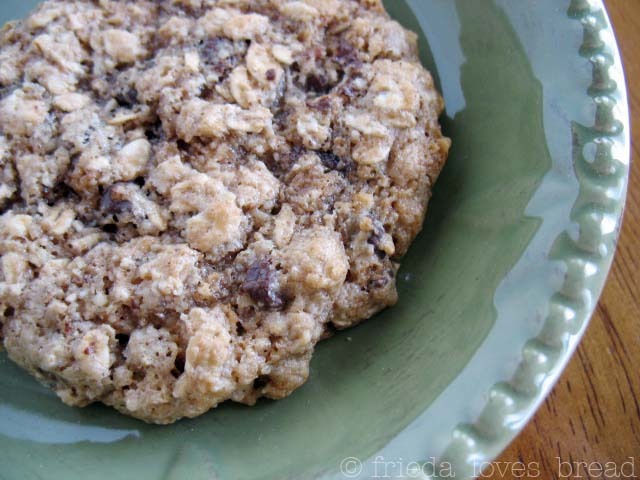 A crispy, chewy center chocolate chip cookie with a hint of cinnamon. Perfectly sweet. These aren't baby size cookies, either. They are over 3" across. I was so excited to bring these over for an official taste test. As he reached for a cookie and took a bite, I told them that each cookie was only 133 calories with NO cholesterol and 7 grams of fat (zero trans fats!). He smiled and promptly reached for another cookie. SOOo....what do YOU think about them? Good, bad? I enjoyed them! 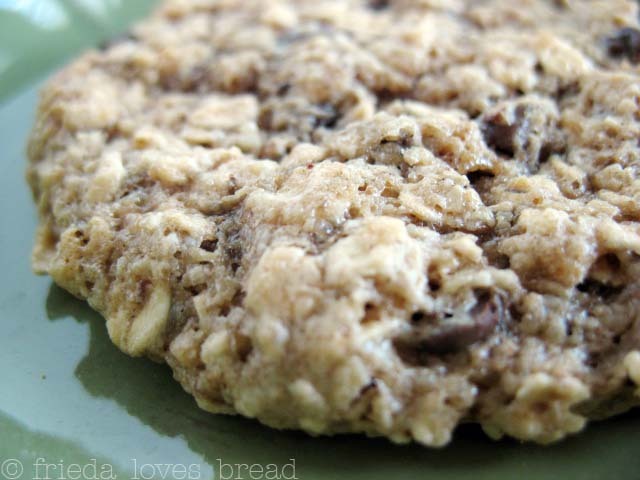 I was pleasantly surprised by the outcome: crispy, chewy, and not too sweet. I love cookies. You can put almost any cookie in front of me and I will fall in love. These look absolutely scrumptious though. And I didn't know that about walnuts. Thanks for sharing. What a lovely gesture and cookie! I would eat them, but my husband would LOVE them! 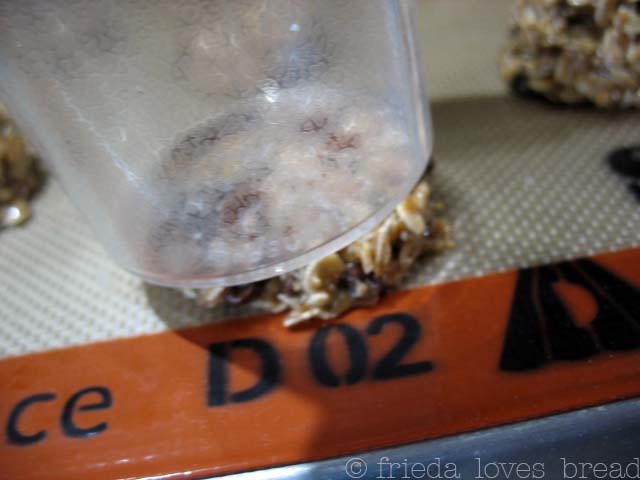 He loves nuts, oats and treats that aren't too sweet....lovely pics too! It feels good to make something like that for someone else. I cant wait to try these! They remind me of a "sweeter" granola bar. I love this recipe, so good for the heart. I will be trying this out soon! Thanks for sharing. I recently made your recipe and gave the cookies to one of my clients as a birthday gift. (I do home health . )They were a huge hit-a nice change from an everyday sweet. DST, I'm glad you made these cookies...I'm happy they were a huge hit!